Have you watched The Price Is Right? Remember that game “Plinko”? 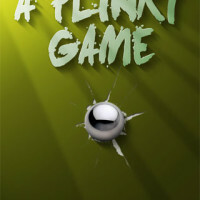 Well, the app “A Plinky Game” is Plinko for the iPhone & iPod Touch. A Plinky Game is a really great Labyrinth spin-off game that involves luck and skills, but I would say it involves a lot more luck than skill. The game play is extremely simple, and yet extremely addictive. The play area is divided into three zones. The top part of the play area is where players begin. 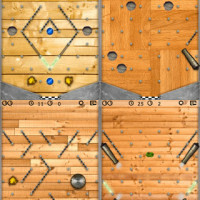 To start, players touch any area of the top part of the play area to spawn a ball. 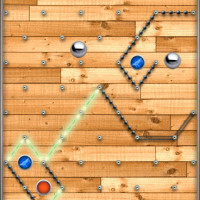 This ball is then pushed by gravity through the obstacles (zone two) and eventually into the goal (zone three). So you can see the idea here. Create a ball and try to reach the goal by avoiding obstacles such as holes in the play area where you can lose your ball. The twist here is that each level is only allowed a certain number of tries (or balls). So use too many tries and you lose! Another neat feature is the option to use the accelerometer instead of just letting the ball go to chance. However even then, gravity plays a huge role. The game includes 72 levels with 18 bonus levels that are unlocked via achievements. After each level is complete, the game auto-saves the completed level and moves you to the next stage. The game also includes a tutorial for those that have no idea what the game is about. A Plinky Game is available in the App Store for $1.99. The app also has a free companion that is very unique. Instead of including some of the paid game levels as they are as a trial, the free app instead includes the paid game levels but the levels are blackened out! This makes game play both challenging and rather annoying but fun! Check it out!